Now a days many people file their own Income Tax Return (ITR) in lieu of taking service of CA or tax consultant. 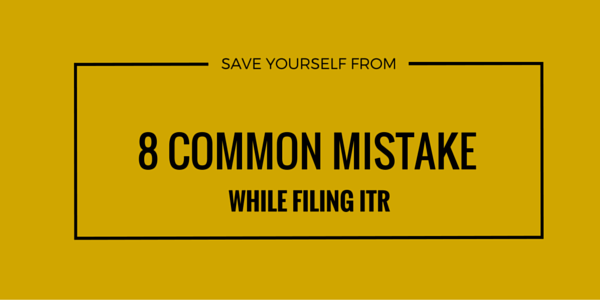 But a number of persons make some very common mistakes while filing ITR. Here we have provided a list of common mistakes so that people can avoid them. Many times assesse’s are not aware of any TDS which are deducted from their incomes. Most common of them is tax deducted from interest accrued to them in the bank’s saving account or fixed deposit’s interest. So always check whether any TDS is made from your income and you can easily do this by checking your 26AS. Many a times people doesn’t show deductions while filing returns because there is no taxable income. They think because there is no taxable income there is no need to claim deductions. But this becomes a problem if assesse’s file go into scruitny and taxable income is increase in it. Now because you had not claim deduction you have to pay tax. If incorrect bank account number or IFSC code is entered then IT refund cannot be processed electronically and assessee has to contact the assessing officer to get the refund’s check. If return is filed without digital signature and without aadhar based verification then a signed copy of ITR-V is to be sent to Bangalore branch of CPC. The time limit for this is 120 days from the date of filing. In many cases the assessee files return in time but forgets to send the signed copy which will invalidate the ITR. Assesse’s may fail to determine whether an investment is allowed as deduction or not. Assessee sometimes claims deduction or claims excess deduction from allowed in the act or in some case don’t claim deduction while they are allowed in their case. Assesse’s fails to determine which ITR form is to be used in their case and ending with filing wrong Income Tax Return form. Many a times assesse’s ignore the exempt incomes such as dividend and ppf interest while filing returns. TAN no.’s of the tax deductor is to be entered with utmost care. Sometimes assesse sees the bank’s statement and enters the receipt amount as income, not considering the fact that the receipts are after deduction of TDS.